Reaching upwards of 450 kilograms in mass, the Atlantic bluefin tuna is a powerful creature, and catching one is an esteemed prize. Because of the size and speed of these apex Atlantic predators, their value is measured in more than just their taste. 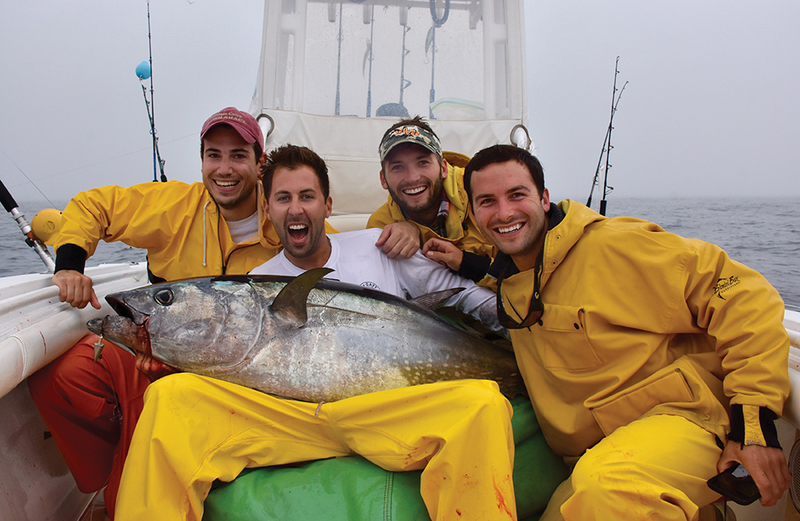 For fishermen, hooking and catching a giant bluefin tuna is a symbol of skill, endurance, and prestige. Because of their global appeal for use in sushi, bluefin tuna are in high demand. Fishermen can be paid upwards of $10,000 for a large bluefin tuna, which creates big business and even bigger competition for this marine resource. As a result, the bluefin tuna is one of the most sought-after fish in the Atlantic Ocean. The fish has a large geographic range, populating areas across the Atlantic Ocean from the equator to the Arctic and spawning primarily in the Mediterranean Sea and Gulf of Mexico. Because of their large range and highly migratory behaviour, competition among nations and fishermen for catches is fierce. Furthermore, monitoring stocks and regulating catch limits can be complicated. Thanks to concerted rebuilding efforts that limit harvest rates on both sides of the Atlantic, there is mounting evidence that the species is recovering after decades of overfishing. However, uncertainty over population structure and dynamics, combined with the threat of illegal fishing, means that managers must remain vigilant. 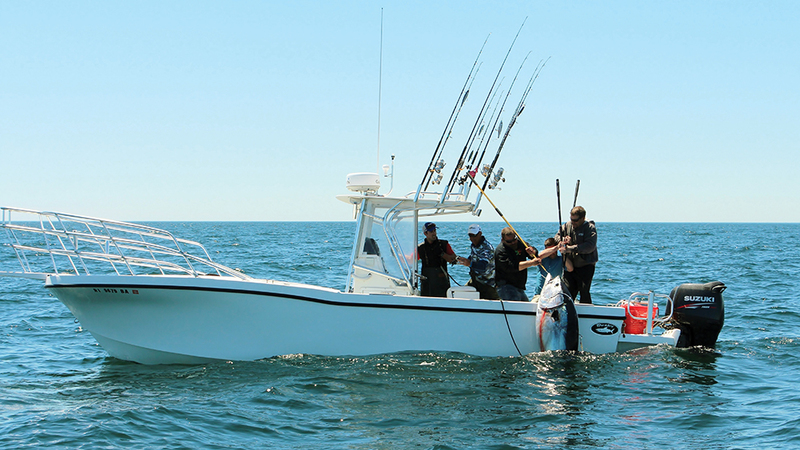 Managing fisheries, such as those that target Atlantic bluefin tuna, can be challenging because each participant may be driven by a different motivation. For example, commercial fishermen may be motivated by profit, whereas understanding what recreational anglers hope to gain from their experiences on the water is less clear. Scientists and managers must work together to tease out these motivations in order to keep this fishery thriving. ‘Without understanding what gets fishermen out on the water, it is challenging to predict how fishing activity and harvest patterns may change as fishery conditions – fish availability, regulations and costs – change,’ expresses Dr William Goldsmith from the Virginia Institute of Marine Science at the College of William & Mary. Dr Goldsmith and his graduate co-advisor Dr Andrew Scheld have been using economic analyses to understand how fishermen’s preferences impact fish stocks – and conversely, how different aspects of the fishery impact fishermen’s wellbeing. Their work has provided managers with valuable insight for recognising best practices for bluefin tuna management. Dr Scheld and Dr Goldsmith’s research investigates how sustainable management of the Atlantic bluefin tuna can be enhanced by better understanding the motivations underlying fishermen’s behaviour. Their research focuses on understanding factors that drive harvests by private recreational anglers and charter captains. They also examine how to promote the wellbeing of fishermen in this highly regarded fishery. It is possible to quantify the economic impact of recreational fishing, estimating how much money is spent by fishermen on fishing-related activities. 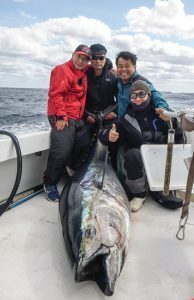 However, it is much more difficult to quantify the welfare benefits that the bluefin tuna fishery provides to fishermen and identify the specific parts of the fishing experience that provide the most happiness to participants. ‘Understanding how fishermen value different aspects of the fishing experience improves predictions of fishing behaviour and also enables managers to consider fishermen welfare when setting regulations,’ emphasises Dr Scheld. Funded by a National Marine Fisheries Service (NMFS) Saltonstall-Kennedy grant and a National Marine Fisheries Service-Sea Grant Fellowship, Dr Scheld and Dr Goldsmith have used diverse methods and outreach to understand what motivates recreational anglers. Some of their work has already been published in the scientific literature. Because of the nature of their study design, surveying anglers across a large coastal area, they engaged in extensive outreach through a number of means, including On The Water Magazine, which helped improve awareness of the study and garner support from the fishing community. The team used quantitative approaches, grounded in resource economics, to answer questions that are essential to the conservation of this highly coveted species. Their unique approach to interpreting the behaviour and response of Atlantic bluefin tuna fishermen offers a novel perspective to help address a long-standing fishery management issue. 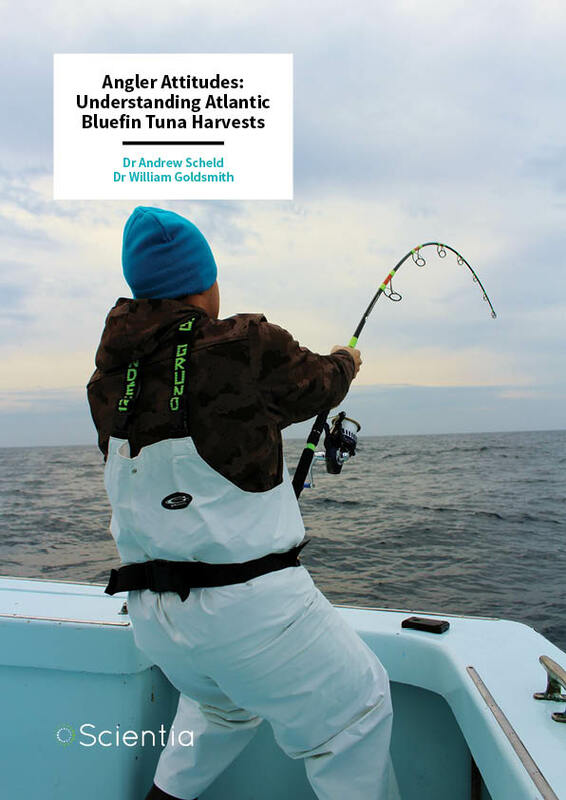 To understand the motivations of Atlantic bluefin tuna fishermen, Dr Goldsmith and Dr Scheld surveyed over 5,000 bluefin tuna fishermen from Maine to North Carolina in the spring of 2016, separately questioning private and charter captains. The questionnaires used ‘mock fishing trip scenarios’ – hypothetical fishing trips described in detail to tease out which attributes within a fishing outing were most relevant to the welfare of the respondents. In choosing their most preferred trip scenarios – consisting of trip attributes such as the number of fish caught, the size of the fish caught, the number of fish kept, and cost – respondents implicitly provided information regarding what factors most affected their enjoyment of fishing trips. The team then used econometric models – statistical models that reveal economic relationships – to understand these preferences. Dr Goldsmith and Dr Scheld were particularly interested in understanding the differences in interests and preferences among fishermen and how the ‘motivations change according to the characteristics of the individual,’ explains Dr Goldsmith. Recreational anglers fell into two major groups: those that relished the experience of being out on the water regardless of what they caught or harvested that day, and those whose enjoyment of the fishing experience was almost exclusively dictated by how many fish they harvested. Interestingly, the former category primarily comprised anglers with higher incomes and those who had recently fished for bluefin tuna. Using model results coupled with fishery data on number of trips, costs and catch rates, Dr Goldsmith and Dr Scheld were also able to quantify the benefits gained by fishery participants. ‘We estimated that the overall value derived by anglers in the fishery (above and beyond their expenditures) was about $14 million in 2015,’ notes Dr Scheld. This risk of exceeding allowable limits results from shifts in fish availability and uncertainty in predicting the annual effort and harvest of fishermen, coupled with the challenge of monitoring catches in near real-time. By working with the fishing community to quantify the motivations of anglers, Dr Scheld and Dr Goldsmith have provided a unique and valuable perspective on this complex issue with data that were previously unattainable. A related study spearheaded by Dr Goldsmith and Dr Scheld examined the most significant factors that influence whether a fish is kept or released once it has been caught by a charter captain, who, unlike a recreational angler, is permitted to harvest a fish either for commercial sale or for personal (or charter customer) consumption. Although determining fishermen’s attitudes and motivations can be difficult, understanding what drives behaviour is crucial to ensure that the benefits of the fishery are being maximised while promoting sustainable harvest levels. By bridging the gaps between scientists, managers and fishermen, Dr Scheld and Dr Goldsmith have provided bluefin tuna fishery participants across sectors answers to nuanced and necessary questions. Such answers are highly relevant for managing the species and sport. 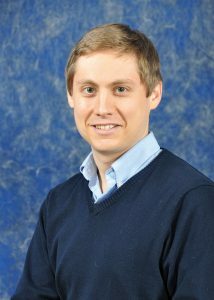 Dr Andrew Scheld is an Assistant Professor of Marine Science in the Department of Fisheries Science at the Virginia Institute of Marine Science, College of William & Mary. His research focuses on the economics of fisheries management, developing and applying quantitative models to analyse fisheries policies in the US and abroad. He completed his PhD in Fisheries Sciences at the University of Washington in 2014, after studying Environmental and Natural Resource Economics for both his Bachelor’s and Master’s degrees at the University of Massachusetts and the University of Rhode Island, respectively. Dr William Goldsmith completed his PhD in Marine Science at the Virginia Institute of Marine Science, College of William & Mary, in January 2018. 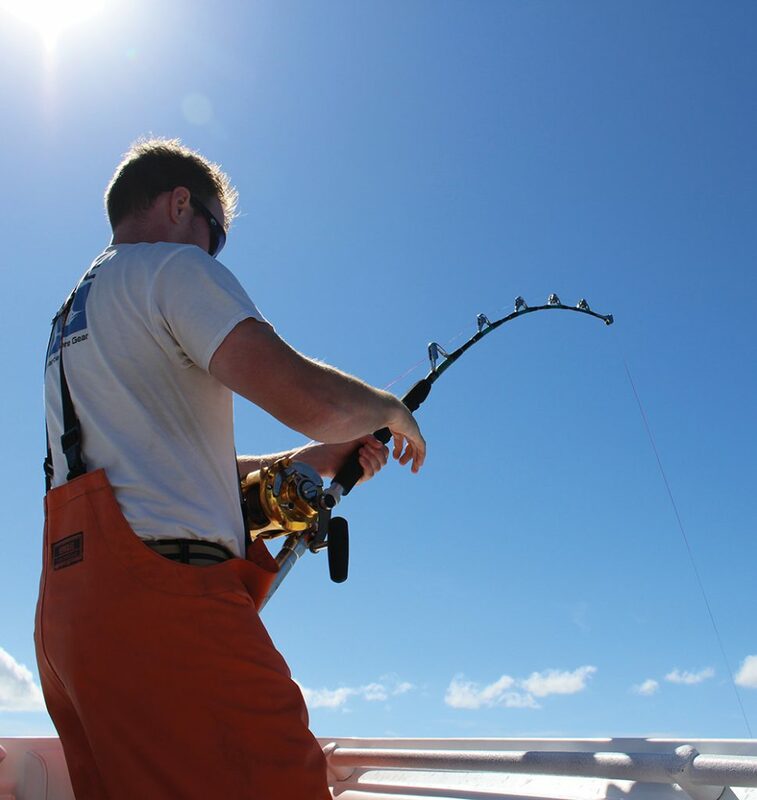 His dissertation focused on characterising the biological impacts and human dimensions of the recreational fishery for Atlantic bluefin tuna along the east coast of the United States. 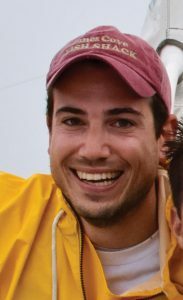 He is currently a National Oceanic and Atmospheric Administration (NOAA) Sea Grant Knauss Marine Policy Fellow in the office of US Senator Ed Markey (D-Mass), where he works on a broad range of energy and environment issues. A passionate recreational angler, Dr Goldsmith is interested in crafting collaborative, multidisciplinary approaches to solving complex fisheries problems. WM Goldsmith, AM Scheld, JE Graves, Characterizing the Preferences and Values of US Recreational Atlantic Bluefin Tuna Anglers, North American Journal of Fisheries Management, 2018, 38, 680–697. WM Goldsmith, AM Scheld, JE Graves, Decision Making in a Mixed Commercial-Recreational Fishery, in prep.